WordPress installation comes with many default packages which are to be cleaned up immediately before you make your site visible to all. This cleanup is very much required whether you installed WordPress on your own or used the popular one click installation on your cPanel. Here is a checklist for launching new WordPress site consists of what you need to do after installing WordPress. The first action item after WordPress installation is to prevent search engines like Google stop accessing your site. Delay in doing this action will lead Google crawl your site and start showing the junk content in search results. For example, take an example of installing WordPress through softaculous script installation on SiteGround hosting. They will add a dummy post with SiteGround resource material added. If you don’t hide your site from Google, this page will be crawled and indexed before you realize it. Navigate to “Settings > Reading” menu and enable the checkbox “Discourage search engines from indexing this site“. Once you are ready to launch, ensure to disable this checkbox before submitting your XML Sitemap to Google. Delete the “Sample Page” before start creating your own pages. Delete the default “Hello World” post and create your own post. Delete default comment from “Mr.WordPress”. For example, when you install WordPress through SiteGround, there will be a resource post added by default. Unfortunately, this is a marketing post having links to SiteGround hosting pages. After installation through Softaculous, you should delete this post manually. WordPress by design needs at least one single category for classifying your posts. In order to ensure this, WordPress installation will automatically have a category called “uncategorized” and add post which don’t have any category attached to it. Once you setup all your categories, ensure to change default post category name from “uncategorized” to whatever you want. You can do this under “Settings > Writing” and change the “Default Post Category” to your own category from the dropdown. If you want to store all your uploaded files in a different directory other than the default “/wp-content/uploads” folder then create a new media folder and set the permissions to 755. Set the upload structure into month and year based folders, so that the uploaded files will be stored in an organized manner. 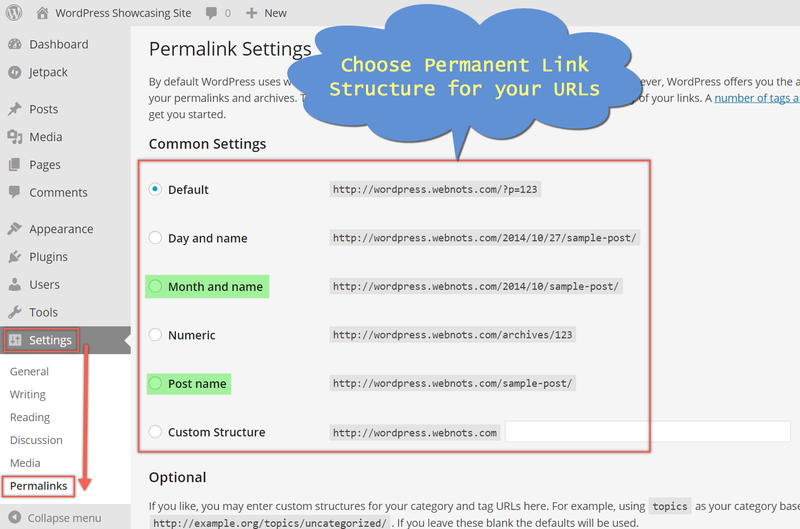 Change permalink structure to custom setting like “/%postname%/” under “Settings > Permalinks“. If someone helped to install WordPress then change your password immediately after login to your admin panel. Also use secured usernames and passwords for your database and never share the credentials with anyone. You WordPress site can have a static home page or a blogroll page showing latest blog posts. Ensure to choose either static front page or latest blog posts as a front page under “Settings > Readings” menu. If you create a static front page then ensure to select only one “Home” page in the navigation menu. You can also setup how many number of posts should be shown on the blog index pages. Ensure to change the site title and the default tagline as per your need under “Site Identity” section of the “Customizer“. Also don’t forget to upload the favicon to be used for your site. Install any SEO plugin and generate XML Sitemap for submitting in Google Search Console and other webmaster tools account. Most installations come with a plugin called “Hello Dolly. Check the installed plugins under “Plugins > Installed Plugins” menu and delete unnecessary plugins like “Hello Dolly”. Also ensure to deactivate not used modules of Jetpack plugin. Redirect modified post URLs to original URLs to avoid “404 page not found” error using “Redirection” plugin. Redirect attachments to parent post URL so that users will view your content instead of ending up viewing your images. We would strongly recommend you to list down the required plugins and start using them on your site right from the beginning. Though you can manage SEO within WordPress, it is benefit to use SEO plugins like Yoast SEO from the start to manage the complete structure of your site. Most commercial themes have the option to enable coming soon or maintenance mode page till the time your site is ready. If your theme does not have the option, install one of the available plugin and ensure to provide necessary information like subscription form till the time your content is ready.